Our May meeting will be May 13th. Today, we read some articles about Hemingway’s writing style, which has been described as “hard-boiled”, and based on the iceberg principle (Hemingway_handout_2015-04-08). We decuded that perhaps “hard-boiled” was not an accurate description of Hemingway’s style or his intention. What he actually wrote was “boiling it down always, rather than spreading it out thin”. Hammett’s most famous story, also made into a movie, was “The Maltese Falcon”, a mystery story featuring the “hard-boiled” private detective Sam Spade. 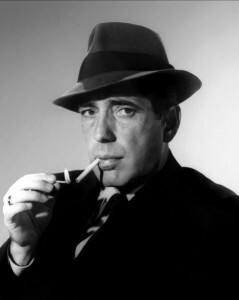 Humphrey Bogart played both Sam Spade and Philip Marlowe. Then we read 3 more pages of the story, up to “And just then it occurred to him that he was going to die.” We argued about what else the man had received in addition to security and comfort, and why he did not seem to know what else he had received, even though he tells the reader. We also discussed what the “return of acquiescence” and “this life of pleasant surrender” referred to. Does he mean surrender to death? Or to the comfort and security of his unproductive, non-writing life with his rich wife whom he does not love? Humphrey Bogart as Philip Marlowe, private-eye.